For this month’s Behind The Look makeup artist interview, we caught up with one of the most inspiring face painters in the biz, Khandiz Joni. Why do we love Khandiz so? She’s an advocate of ethical and green practices in beauty, as well as the Co-Founder of green creative agency Ethical Beings, which she set up with ethical stylist Alice Wilby. We know – she’s quite incredible. Khandiz is known for her beautiful bare canvases so our choice of this bold blue eye is an unusual pick; by her own admission, she’s “a minimalist when it comes to application.” What can we say – we love bold eye makeup! The look, Simple Concoctions, was for The Magician issue of Khandiz’s beauty platform UNTAINTED, with the narrative being beauty hacks. The look featured was to illustrate that by mixing different concoctions, in this instance, loose pigment eyeshadow and various mixing mediums, you can achieve so many great looks! Working with photographer Thea Baddiley, whom Khandiz has known for years, Hair Stylist Kerri Ewart and model Eva, the set was a calm atmosphere for the all-female team. Although Khandiz knew what the concept would be, she hadn’t planned exact looks and describes the day as a challenge to herself to step away from her usual looks, to prove she can be more “commercial” when need be! Products used included gems from Tata Harper, Inika, Lavera, and Lily Lolo. To create the gorgeous two-toned eye, Khandiz mixed Hiro Mineral Eyeshadow in Emerald & Naughty Call with Skin & Tonic Rose Mist for easy paint-on application and seamless colour blending (you could also use Dr.Lipp to mix pigments). 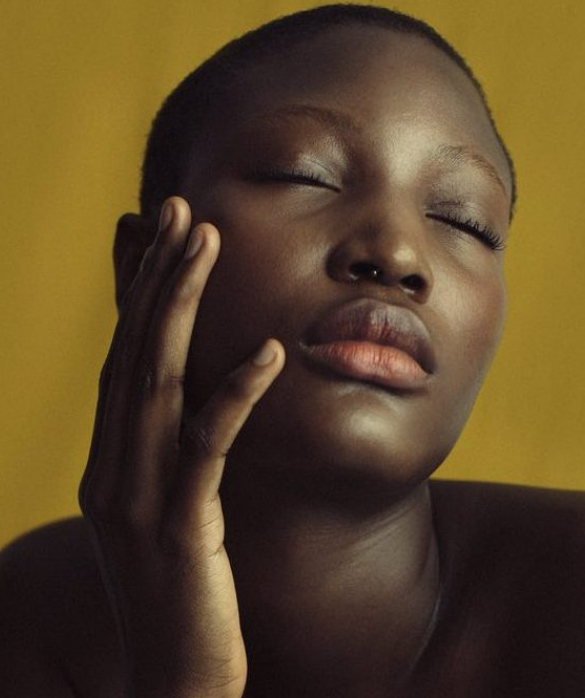 As well as working as a make-up artist and creating content for UNTAINTED, Khandiz represents green and ethical creatives through her agency Novel Beings with Alice. The pair met on a shoot in 2013, after a year of Khandiz pondering how to channel her passion for decreasing her impact on the environment. When South African-born Khandiz came to the UK from Cape Town, where she had run an agency that represented up-and-coming hair and make-up artists, she wanted to get the same thing up and running in the UK but was lacking in resources. Now, Novel Beings represents a whole roster of talented creatives across beauty, fashion and lifestyle. Inspired by Khandiz’s work, we picked her brains for those wanting to make an effort to be greener. Research is paramount, she informs us, as is knowing the cause and basing decisions on it, rather than on scare tactics. “For example, if you have become a vegan for environmental reasons, understand that doesn’t mean that using ‘vegan’ beauty products is a more environmentally sound option,” she tells us. We couldn’t agree more, Khandiz! "I like that Dr.Lipp is a single ingredient with multiple uses."